Used as a celebration to honor the coronation of King Alfonso VIII, bullfighting has become one of the most iconic traditions in Spain. As a bloody and violent sport, bullfighting in Spain is very controversial, creating continual disputes between the moral activists and the die-hard fans. Bullfighting is a spring to autumn sport with Sundays being the busiest days. 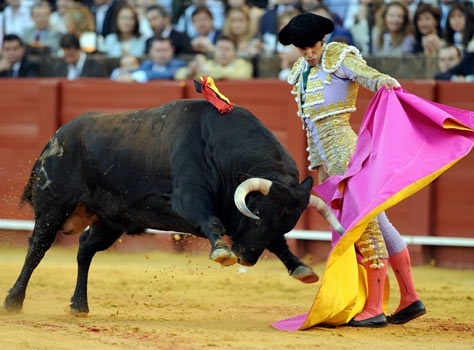 Madrid holds the San Isidro Bullfighting Festival in June at La Plaza de Toros de Las Ventas. Seville begins its bullfighting season during Seville’s Feria de Abril at the Maestranza Bullring in April. La Plaza de Toros de Las Ventas, Madrid: Home to the San Isidro Bullfighting festival in June, La Plaza de Toros de Las Ventas has a seating capacity of 25,000. Built in 1929, this is the most important bullring in the world. Maestranza Bullring, Seville: Although this ring only seats 12,500, it attracts the top bullfighters. Built in 1758, Maestranza Bullring is also the oldest ring in Spain. During Seville’s Feria de Abril, the bullfighting begins which lasts to October. Ronda Bullring: Even though Ronda is considered the home of bullfighting, the actual bullfights at this bullring are very infrequent. Built in 1785 by Philip II for horsemanship training, it's one of the oldest and most beautiful rings in Spain. During the horsemanship, training bulls were used; when an aristocrat fell off his horse, Francisco Romero used his hat to distract the bulls, thus becoming the origin of today’s bullfighting. If you would like to experience bullfighting in Spain, tickets are bound to be one of the things you should take into account. When buying bullfighting tickets, it is important to know that the tickets are not usually computerized. Since bullrings do not have much of a web presence, if you want to buy your tickets ahead of time, it is best to buy your tickets from a broker. Most of the time, it is best to purchase your tickets directly from the bullring. Make it your first stop when you get to your destination. The cheapest tickets are those located in the sun (sol). The mid-priced tickets are those that start in the sun and end in the shade (sol y sombra). The most expensive tickets are those that seat you in the shade (sombra). Bullfighting was introduced to the Western world in The Sun Also Rises by Ernest Hemingway. Since its introduction, bullfighting has continued to grow in popularity and attract tourist from all over. Held in a round shaped arena called plaza de toros, bullfighting in Spain is an event that consists of six individual fights. There are 3 toreros, each fights two bulls. Each event begins with a parade that presents the toreros to the audience. The cape stage where the matador antagonizes the bull. The picador stage where the bullfighters on horseback taunt the bull. The killing stage that wraps up the fight with the matador killing the bull. The senior torero will be in fights one and four, followed by the second oldest matador in fights two and five with the youngest (or least experienced) fighting in the third and sixth fights. If at any time a matador is injured to the point that they cannot fight, the senior matador will continue in their stead.